The Columbia White Dot Pink and Black is a colorful ball that features a plastic coverstock and a round core with a pancake weight block. This ball makes a great spare ball for any lane condition. (10-16) - Round core with pancake weight block. (6, 8 & 9 lb.) - Foam urethane. This was my first ball, and I was afraid it wouldn't be right for me. But, as soon as I rolled the ball, it felt like I was in heaven(no seiously, I heared "Hallalouia"! )My first 3 frames got me a turkey! Defidently richeous. Had only been out with this ball about fives times, when I heard a crack and the ball came back with a six inch crack down the middle. Big disappointment. I use my ball in league bowling and for casual use. It just the right weight for me and not too much hook. Bought this for my girlfriend & she loves it. I noticed her avg improved greatly. It's a steal at this price too! "Improved scores the very first week"
I have greater control with this 7% curve ball than I did with my more expensive one with lots more curve ability. And I dress to match my ball! I bought this ball twice for my child. Each time the ball cracked. The ball was the 6lb variant. I do not know if heavier balls have the same issue. Got this for my girlfriend as a gift. She loves the color design and it's light enough for her. When under the black light, the black on the ball puts off a blue color. She seems to like it, so i'm happy! I love this new bowling ball. This is my first ball, I got it as part of a league I signed up for. Free ball at the end of 8 weeks. The design is great and the grip is comfortable. Sometimes the Hook is unpredictable but this was designed as a straight lane bowler. I have the 13lb ball and sometimes the pins are stronger than the ball. Do you do finger tip drilling and how much is it? Hello! On plastic we currently only offer basic drilling for $14.95. 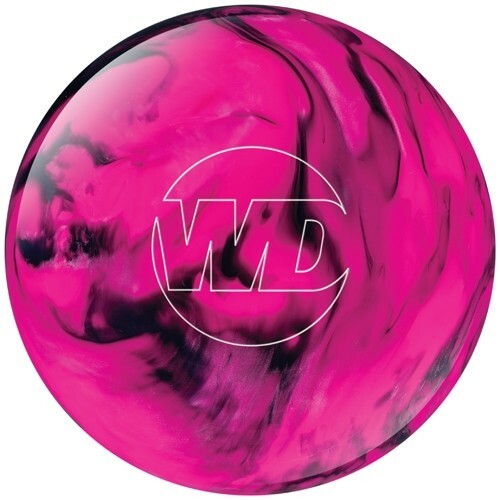 Would you recommend this ball for college bowling ? Hello! I probably wouldn't recommend this ball for competing at such a high level since it is a straight ball. You will probably want to go with a performance ball of some kind so you will be able to hook it. Unfortunately this ball does not glow in the dark. There are a few balls that have additive to help them glow under black light but this ball does not mention having this additive so it would not be able to glow under black light either. Our Free Ground Shipping is usually 3-7 business days. Due to the time it takes to produce the Columbia White Dot Pink/Black ball it will ship in immediately. We cannot ship this ball outside the United States.